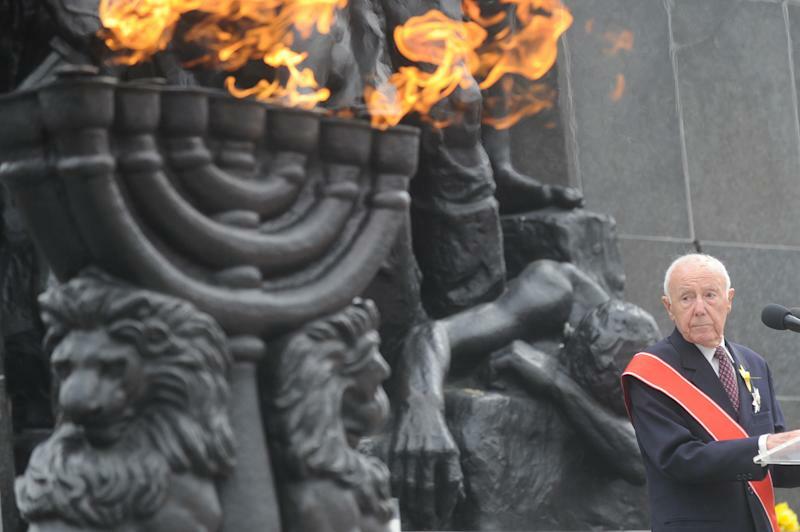 WARSAW, Poland (AP) — Sirens wailed and church bells tolled in Warsaw as largely Roman Catholic Poland paid homage Friday to the Jewish fighters who rose up 70 years ago against German Nazi forces in the Warsaw ghetto uprising. "We knew that the end would be the same for everyone. The thought of waging an uprising was dictated by our determination. We wanted to choose the kind of death we would die," said Rotem, an 88-year-old who is among a tiny number of surviving fighters and was the key figure at the ceremony. "But to this day I have doubts as to whether we had the right to carry out the uprising and shorten the lives of people by a day, a week, or two weeks. No one gave us that right and I have to live with my doubts." Rotem's uncertainty is in stark contrast to how the world remembers the revolt. Though a clear military defeat, it is hailed as a moral victory for the Jewish fighters, who refused to go without a fight to the gas chambers. It is prominently commemorated in Israel, part of a never-again ethos that stresses the importance of self-defense. "The Nazi Germans made a hell on earth of the ghetto," Komorowski said in a speech. "Persecuting the Jews appealed to the lowest of human instincts." During the ceremonies, Komorowski bestowed one of the country's highest honors on Rotem — the Grand Cross of the Order of the Rebirth of Poland. Later the two of them, along with Israeli Education Minister Shai Piron and Wladyslaw Bartoszewski, a Polish Auschwitz survivor who helped rescue Jews during the war, walked side-by-side to the monument and bowed before it as soldiers laid a wreath for them. To a military drum, other dignitaries followed them in paying their respects at the dark memorial to suffering and struggle, including Polish Prime Minister Donald Tusk, members of Poland's Jewish community and U.S. Ambassador Stephen Mull along with an American survivor of the Warsaw ghetto, Estelle Laughlin. Poland's chief rabbi and a cantor also recited mournful Hebrew prayers as they were joined by three Polish army chaplains, one Catholic, one Eastern Orthodox and one Protestant. Psalm 130, which starts, "Out of the depths I cry to you, O Lord! ..." was recited in Hebrew and Polish. Officials had announced that a second surviving fighter, Havka Folman Raban, would also participate, but she was not featured in television coverage and it was unclear if she actually was there. It's not clear how many of the fighters are still living, but the number is tiny, with Polish authorities saying they believe there are perhaps four. One, Boruch Spiegel, is 93 and living in a home for the elderly in Montreal. He was presented with a state honor in Warsaw on the 60th anniversary of the uprising but was unable to attend commemorations this year. Throughout Warsaw, national and city flags fluttered from city buses, trams and public buildings as authorities made an unprecedented effort to encourage Poles to remember the ghetto fighters and Jewish suffering during the war. Warsaw city hall said it is the first time that churches in the capital rang their bells to mark the anniversary. Though the Warsaw ghetto uprising is well-known worldwide, it hasn't received the same level of attention among Poles, for whom a separate city-wide revolt in 1944 plays a much more critical role in national memory. 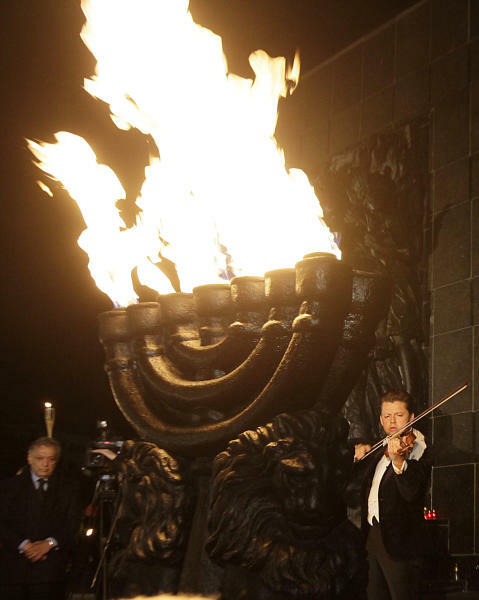 The events Friday followed an evening of commemorations on Thursday featuring the Israel Philharmonic Orchestra. 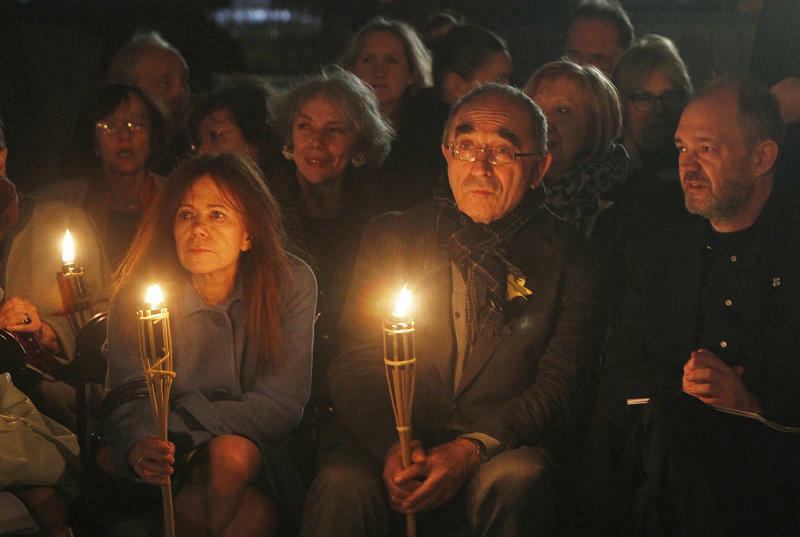 Israel also marked the anniversary of the uprising on its Holocaust Remembrance Day, April 7, which coincided with the Hebrew date of the anniversary of the Warsaw ghetto uprising. AP reporter Monika Scislowska in Warsaw contributed to this report.